You must be familiar with the saying, “Life is 10% what happens to you and 90% how you react to it.” Apart from opportunities and accomplishments, this 10% includes untoward events such as death, disease, or disability. You or your family can react better to such eventualities only if you’re prepared. While no one plans to fail, many fail to plan. You don’t want to be that someone who didn’t provide for the financial security of your surviving family after you’re gone. On the contrary, you’d want them to have a regular monthly income even if you’re no longer around. A term plan is the solution to this problem. In fact, term plans can be the legacy you leave behind for your family, which protects and provides for their sustenance and care even in your absence. And if you think that premiums for term insurance are wasted as there is no pay-out unless the policyholder expires, you probably won't be alone. But then, what about a car or health insurance, where, unless there is a claim, there is no pay out? These are protection products - they provide financial support to the nominees of policyholders, leaving them less vulnerable to the vagaries of life situation. Premature death exacerbates the traumatised surviving family's loss with disruption in income. As further investments in assets such as PPF, MF, equity, and gold stop abruptly, the incomplete corpus of wealth can't provide for your spouse in old-age nor for your child's higher studies. Term plans turn out to be apt for dealing with the distress of this risk, as they offer guaranteed protection to your family, by paying them the sum assured, upon your death during the policy's term. To be adequately prepared, you may want to consider Aegon Life’s iTerm Insurance Plan – a comprehensive financial protection solution as an online term plan for up to 100 years. It’s cost-effective with low premium rates, especially for non-smokers and women, and with a high sum assured. Related: How much cover is enough? 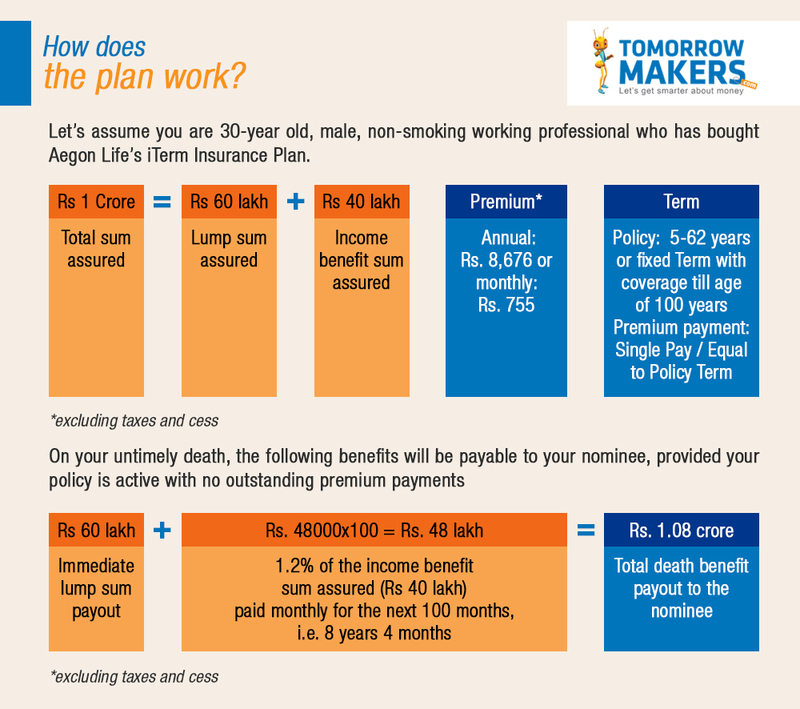 With its extensive features, Aegon Life iTerm Plan can protect your family against financial distress upon your death. You can contentedly live in the present, knowing that you’ve provided for your family’s comfortable future without you. Terms plans are relevant when you have dependents - spouse, children, and parents - who might need protection from short-term liabilities such as loans upon your death. Savers are increasingly realising it is crucial to separate protection needs from investment needs. Moreover, a substantial term life insurance plan at an affordable price will help you achieve better benefits in terms of protection, along with better transparency in terms of costs incurred. As Term plans are available online, they are easy to understand, compare, and buy. Also buying a term insurance plan online could be easier on your pocket as compared to buying one from an agent. Furthermore, as the purchase is from the comfort of your couch at home or desk at the office, the only time you may need to move is for the preliminary medical tests. Even these tests are mostly conducted at your home. Most people tend to neglect or delay buying term plans because they think they might outlive the policy term, and will lose out on the benefits that it provides. This however, is not the case with Aegon's iTerm plan, which offers coverage upto 100 years ensuring you reap the benefits that this plan provides. This way you can be certain that you are not only leaving behind financial protection for your kids and grandkids but you are leaving behind a legacy for them for when you are not around. It is truly a ‘protection that grows with you'. Disclaimer: This article is intended for general information purposes only and should not be construed as insurance or legal advice. You should separately obtain independent advice when making decisions in these areas.